Commemorating the family of Samuel and Margaret McCrindle, who emigrated by ship from Scotland to Australia. Ranald had five sons. The eldest was called Alan (d.1430) who succeeded as Chief of the Clanranald. Alan's younger brother Donald became Chief of the Clan MacDonell of Glengarry. In a bond of manrent, dated 1571, between Angus MacAlester of Glengarry and Clan Grant, Glengarry makes an exception in favour "of ye auctoritie of our soverane and his Chief of Clanranald only". 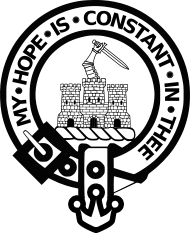 This is held by Clanranald of Moydart as an acknowledgment by Glengarry of the Captain of Clanranald as his chief. The name McCrindle is a derivative of McRanald.